Today we're trying something new which may or may not become a regular fixture here on A Natural Detour. Whilst I'm not sure the format of What I Eat In A Day posts would work for me I thought it might be interesting to share some of the new things I've cooked over the last week, sharing dinner ideas and also showing how I've adapted recipes/ideas to suit a free from diet, similarly to my 30 Recipes challenge back in January. If you'd like to see more foodie posts like this let me know! As soon as I saw this new Minimalist Baker recipe pop up on Bloglovin' last month I knew I had to try it out. Whilst I've baked with nut butters before I'd not really ventured into using them for savoury dishes until last week. This recipe uses almond butter as part of the marinade so I followed this step, then added in some peanut butter when cooking the veggies. As you can see I did manage to overcook the tofu when I transferred it from the oven to the pan but it still tasted pretty good, albeit a little heavy on the chili flakes! Having opened a block of tofu for the stir fry recipe I had some extra and this was the dish I threw together with the leftovers. Instead of marinating in the nut butter mix I sprinkled the remaining tofu cubes with oregano, salt, pepper, paprika and garlic granules then baked them in the oven until crispy. 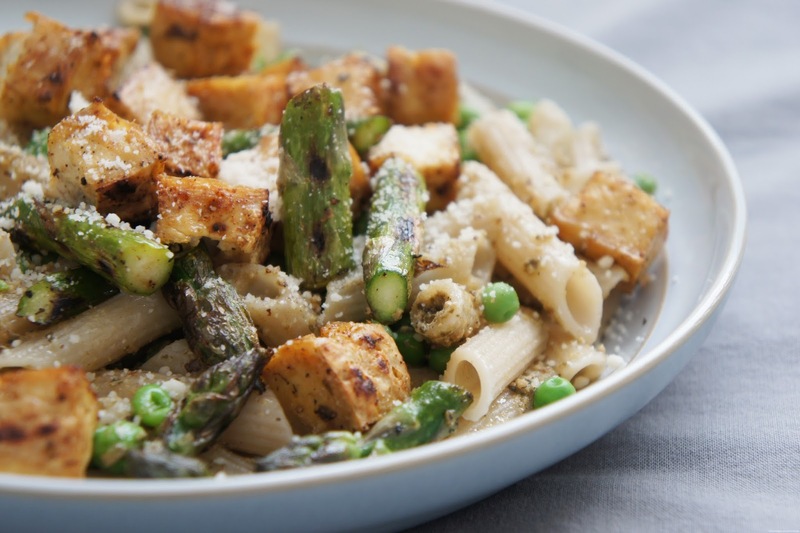 I served the tofu with brown rice penne, asparagus, petit pois, green pesto and a generous sprinkling of my favourite parmesan substitute from Follow Your Heart. A new favourite of mine is this mushroom stroganoff creation, inspired by a BBC Good Food recipe. Last week was actually the second time I've made a version of this dish and whilst both were tasty this one definitely had more flavour than the first attempt. In all honesty I didn't take much notice of the quantities in the original recipe but for the sauce I used around 200ml vegetable stock and around 2/3 of a carton of Oatly cream for two servings. For extra flavour I used three different types of mushrooms, Quorn 'chicken pieces' and a healthy glug of Biona's Worcestershire sauce which is both vegan and gluten free. This pasta bake recipe from Buy This Cook That was one I recently discovered when searching for a new dish that would use up leftover asparagus. To adapt the recipe I used Quorn gluten-free sausages and instead of marinara sauce mixed chopped tomatoes with garlic oil, oregano, salt and black pepper. I topped off the pasta bake with some mozzarella style shreds from Tesco's new range of dairy free cheese. These seriously look so so good!